For over 5 Decades the Television Classic Rudolph the Red Nose Reindeer has captured our hearts.&nbs..
33034 Approx. size (H x W x D) 3.15 x 4.53 x 3.43 inches 8 x 11.5 x 8.7 cm Y.. Product Details SKU#: 65117 Approx. size (H x W x D) 11.30 x 4.13 .. Product Details SKU#: 63283 Approx. size (H x W x D) 7.48 x 3.74 x.. 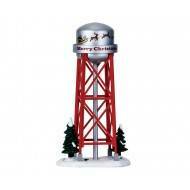 This festively decorated bell tower is the perfect addition to any holiday décor. Fashioned after the bell towers that were the center of small towns across the country, the Thomas Kinkade Bell Tower brings together light, music and special effects in an inventive new way all in one glorious display. With three stories of merry holiday decorations, it is the perfect centerpiece to any holiday home décor! Fine and fascinating features abound in the Thomas Kinkade Bell Tower everywhere you look—and listen! Beautiful sculpting make this impressive (13” high!) building a real eye-catcher. Just as eye-catching is the panel of lighted “bells” on the front of the building. Clever lighting effects make these bells actually look like they are swinging in time to the gentle sound of carillon chimes. As the bells joyously “swing,” a medley of classic holiday songs (“We Wish You a Merry Christmas,” “Silent Night” and “Joy to the World”) ring out. 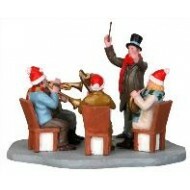 This medley of beloved Christmas tunes was created EXCLUSIVELY for the Thomas Kinkade Bell Tower. All in all, an impressive union of all the things that make Christmas a special time. As a centerpiece for your holiday decorating, it’s certain to become a treasured tradition for years to come! The Thomas Kinkade Bell Tower is impressively sized at 13" x 5.25" x 5".